Everything runs smoother with North Bay Restoration on the job. Many common cleaning products do more harm than good. Household cleaners, as well as alcoholic and carbonated beverages can etch natural surfaces, dulling their display. Foot traffic, abrasive grit, moving furniture, or even vacuum-cleaner wheels will slowly “sand down” surfaces; reducing their original radiant luster. Your first thought may be that your investment is ruined, but this is not usually the case. Beyond removing just dirt, stains, and other contaminants, we at North Bay Restoration, can in most cases, effectively remove waxes, polymers, and other heavy coatings, which dull and dim the finish; leaving a cloudy, lifeless display. 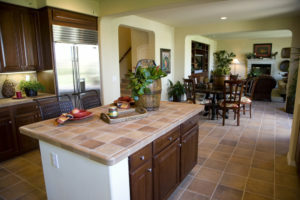 Our techniques will greatly improve the look, increasing the protection and durability of the tile and grout substantially, but cannot be expected to bring the surface back to its original specifications. In organic materials, an aging process naturally occurs which changes its appearance. Our goal is to achieve the highest quality results possible. "I highly recommend Tim Lee for stone restoration in Northern California..... Tim is personable and has the experience and proper equipment to do his work meticulously!" Initial protection via application of a high-quality sealant is extremely beneficial. If concrete, tile, natural stone, and grout are not properly treated with protective agents, liquids, even water, can easily penetrate the materials; leaving unsightly stains and mineral deposits. The best solution is the application of an appropriate, long-lasting sealant to all hard surfaces, which will greatly help to guard against even the toughest stains. Our selections of premium impregnator sealants provide deep protection from water, acid, and oil-based stains. 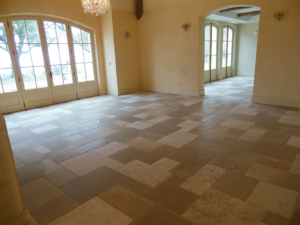 Furthermore, we frequently recommend color-enhancing formulas, which enrich the natural luster of stone, concrete, and tile, while furnishing a penetrating sealant to preserve its radiant beauty. All our recommended high-quality sealants range from medium-to-premium price for both transparent and color enhancers formulas. In most applications, we offer property owner and contractors several options of sealants from which to choose. All sealed surfaces will require routine cleanings. Property owners will be advised of appropriate maintenance programs with products which may be purchased at local tile stores. (Please see “Maintenance”). There are a few options for grout repairs. A simple assessment will quickly determine the most practical approach; whether a basic re-grout will do the trick, targeting only the problem areas or an entire re-grout is necessary. 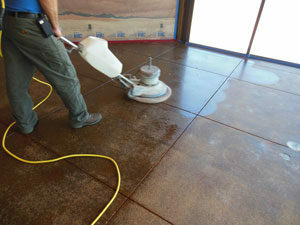 Both processes may be wonderfully enhanced by the application of epoxy stains. Re-Grout If substantial areas of structurally sound grout exist, the faulty grout will be removed via hand-held machines. Once the area has been well vacuumed to remove any remaining debris, the problem joints will then be re-grouted. Although this is the quickest and easiest of grout repairs, it is very difficult to match old grout, even when the original grout color is still available. As is the case with any organic materials, an aging process naturally occurs; changing its appearance. The best remedy is a blend of several grout colors to match the primary grout. This seemingly simple step can be tricky and definitely takes an experienced, artistic eye. Absolute perfection cannot be expected. Epoxy Grout Stain When grout has been modeled (discolored), chipped, or broken out in small areas, while the majority is still structurally sound, a simple re-grout may quickly resolve the problem. When epoxy staining is recommended, it is not crucial to match grout colors exactly, as the entire project will then be stained, leaving a stately even tone. 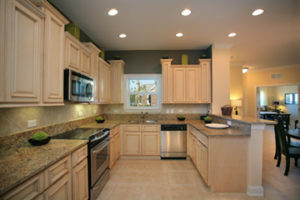 Sometimes a fresh, modern look is desired while re-grouting is not necessary. The application of an epoxy stain is the perfect answer for this project. With many different colors from which to choose, the unsightly outdated tile will be transformed into a stunning, vibrant surface within a few short hours. Each joint is carefully painted with a durable reviving color of your choice. After sufficient drying time (approximately 1 hour) the joints are then gently and intricately washed. Another 24 hours will perfect (cure) the epoxy stain into a sleek, yet nearly bullet-proof finish! Added bonus – No need for sealants! Broken, chipped, and/or cracked tile can be a real thorn in your side. True to Murphy’s Law, these damaged areas usually appear smack in the middle of everyone’s radar. Although removal and replacement can be a tricky job, it’s just another area of our expertise. Please keep in mind, although we regularly replace damaged tile, occasionally, during the removal process, adjoining tile will crack or break. North Bay Restoration calculates in the error factor and will advise property owners of alternate solutions, if sufficient replacement tiles are not available. North Bay Restoration uses a unique light-hardening, compound-material technology for the high-quality repair of natural and engineered hard surfaces. Our system repairs cracks and defects in stone including; spalling of edges, holes, and most deep scratches…. North Bay Restoration uses both chemical and diamond-grinding processes to revive the striking elegance of natural stone. Both techniques remove most scratches, hazing, water spots, etching, and wear patterns from normal foot traffic; restoring its natural appearance. Occasionally natural stone will “bruise” when in contact with intense pressure. Bruising discolors the area around a deep pit mark or heavy scratch. Our techniques will greatly diminish the appearance of these blemishes, but some slight scratches, pits, stains, or bruises may remain. Still the results are absolutely stunning! A huge improvement! We’ve gotten numerous calls over the years from panicked home owners stating their once-glittering, flawless stone counter tops, floors, or bathrooms have been severely etched due to the use of inappropriate cleaning products. Worse yet, these disasters are frequently caused by inexperienced cleaning personnel. 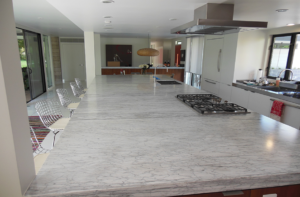 While this kind of damage is not considered an “easy fix,” North Bay Restoration provides diamond-grinding and honing services which restore the luminous natural glow of most marbles, travertines, limestones, granites, and even terrazzos. Our unique abrasive polishing processes remove hazy, etched imperfections, as well as water deposits, minor scratches, and most stains. Some slight dust may occur, but in most cases is not noticeable, as our equipment uses an internal vacuuming system, which catches dust before it becomes airborne. "Our floors look great; we get so many compliments, especially from people who know what they looked like before!" Lippage is caused by unevenly installed tile resulting in the projection of profound high-and-low areas. Obviously, this is not only a safety hazard for foot traffic, but unfortunately portrays a reckless, shoddy image. Frequently with lippage issues, the setter’s job was made more difficult due to the purchase of ungauged (thickness not uniform) tiles. Property owners, after spending a small fortune for the purchase of materials and installation, do not need to tolerate such obnoxious imperfections. North Bay Restoration will continue the Old-World traditional craftsmanship. Customary of European’s careful craftsmanship, the stone tiles are set, and then ground in place, creating a superbly-finished flat surface. North Bay Restoration will continue the Old-World traditional craftsmanship by machine grinding the problem areas for a more uniformed appearance. The process is performed using special equipment which causes very little dust. Once the floor has been thoroughly cleaned, a sealant will be applied. The results are absolutely stunning! A floor to impress even the most scrutinizing eye! No more safety concerns! The total construction will be exquisite, dazzling, and complete! Property owners will then be instructed of maintenance programs with cleaning products which may be purchased at local tile stores. (Please see “Hone & Polish” & “Maintenance”). Are wet slippery floors endangering your home or business? 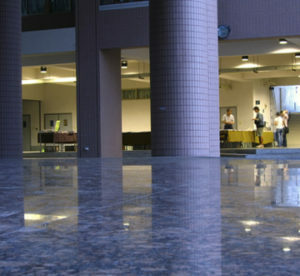 It is a simple fact that the combination of water on a tile or polished concrete floor creates a treacherous situation. In today’s litigious society one cannot afford negligence in regards to safety. Last year the average slip/fall settlement approached the six figure range and continues to be a monumental problem. Thus, having slippery floors is no longer a liability you can afford to ignore. Take action to make wet slippery floor surfaces safer! Slip Tech is the industry leader in non-slip technology. Our unique process creates a coefficient of friction far exceeding the A.D.A. (Americans with Disabilities Act) guidelines. Slip Tech can be applied to any existing natural surfaces such as ceramic, granite, marble, concrete, and quarry tile floors. Our safety floor treatment is also extremely effective on porcelain surfaces such as bath tubs and shower floors or front walkways. One treatment will last up to 10 years. Because the Slip Tech process is not a coating, there is nothing which could wear off. Slip Tech’s product microscopically roughens the surface which miraculously makes the floor safer wet than when dry. North Bay Restoration uses an excellent slip-protective treatment which may potentially save you avoidable burden, thousands of dollars, and tremendous grief, should an accident ever occur. For more detailed information please call us or visit Slip Tech. "My downtown office front walkway was extremely slippery. I knew I had to do something fast when a client fell on a rainy day. Fearing a lawsuit, I called North Bay Restoration & Tim Lee came right out to give me an estimate; even agreed to do the work the following week. The dangerous slip issue was resolved quickly. What a relief! Well worth the costs!" North Bay Restoration offers a variety of stunning concrete stains, with vivid rich hues from a wide spectrum of color schemes. Concrete staining is an amazing compliment to any home-improvement or commercial building project where a quick transformation is desired. Extraordinary colors and depths will dazzle dingy concrete into exotic, elegant surfaces. With penetrating formulas, our coatings will also help increase the durability and protect your concrete for years to come. Call NBR for details on how to expand your use of concrete via our creative uniform-colored trowel downs, spray textures, acid stains, color-flake quartz systems, and metallic-fusion dyes systems. 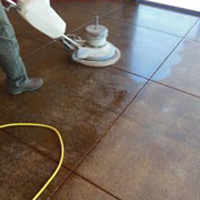 NBR also offers services for maintenance of all concrete, which helps to extend its life & beauty via deep cleaning/power washing & sealing with solvent-based impregnators.